I am at www.BlueSpiritcostarica.com and the area around NOsar is absolutely lovely. Immense coast line of great pristine, untouched beaches, no garbage anywhere, the environment totally protected. Blue Spirit is a dream ! overlooking the coast and the ocean. The food is vegetarian and sensational– beyond delicious– with “cleanse” menus, and an all raw menu options. Although most of the people coming for this educational holiday are American, they are of all ages, curious, loving the options to dance, do yoga, meditate do ChiGung, or study Tantra with Margot (next week) or shamanism with John Perkins. When going out of the main Blue Spirit buildings, one walks past a lovely salt water swimming pool; and, turning to the right along a well tended jungle pathway for about 5 to 7 minutes, a green sloped field leading to a gorgeous white sand beach comes into full view. The sea smells of salt and sea brine, and marine life is breathtaking. Today I witnessed a gorgeous sunset, and observed the pelicans who visit in droves. They fly low and gracefully over the waves and suddenly plunge, beak first into the water to retrieve their food (amazing how they know exactly where to find the fish)… And then there came a company of eagles ! choosing a high tree to settle on for the night…. so many birds of all colors and sorts. The air is pure, the sun is orange and fills the horizon with an incendiary fire glow. Joan touched me deeply because I’ve known her a long time…. and at 70 years old, she is still amazingly fresh and sprightly ! Fancy traveling the world to teach at 70 years old ! I decided to go on a fun rugged adventure and rented a Quad – a four wheel monster equivalent of a dune buggy– I drove this mean machine all around the dusty roads and had a blast! The people here form a unique community that is thriving ! About 50 to 100 people join every week anew !!! Join me and John Perkins for 2012′s high vibe gathering at Omega’s Blue Spirit Retreat and learn to reach your highest potential. I invite you to fully awaken to the transformative potency and power of 2012 by joining me in Costa Rica for the retreat of a lifetime! 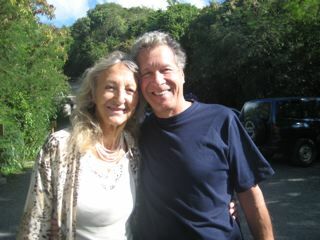 Teaching alongside me for this special weeklong experience is John Perkins, author, activist leader, and shamanic guide. Together we will be co-presenting a weeklong program of Caribbean delights with a team of other Omega Institute visionaries, and sharing ancient and modern teachings. Experience the best of Sky Dancing Tantra and Beyond, Achieving Peace Through Higher Consciousness, Qi Gong, Feng Shui, Yoga, 5Rhythms and more. John has been my friend for years and I consider him one of the world’s leading inspirations and teachers. But that’s not all–we’re going to have an amazing time cocreating bliss together with a talented team of instructors from a number of fields and sharing a uniquely tailored program of awakening and expansion, set in a lush jungle resort on the northwest coast of Costa Rica. * For more details, visit: http://www.eomega.org/omega/workshops/f468c08828868fef7d9389488c25f659/?… call Omega Register at 877.944.2002 today. See you in Blue Spirit! John Perkins, author of Confessions of an Economic Hit Man, quit working for the World Bank and the United States government when he realized he was part of a system that was transforming the once-respected American republic into a feared empire. Having also worked with shamans and indigenous populations around the world for four decades, Perkins shows you how to achieve personal and global peace and prosperity by expanding consciousness and shapeshifting our institutions. Discover innovative, concrete ways to use shapeshifting practices to transform yourself and the world.